The majority of office workers don’t print from their mobile devices because they don’t think it’s an option. What if that weren’t a problem? Well, it’s not. “There’s an app for that” is a pretty common phrase these days and in this case is true – there’s an app for printing from smartphones. For personal printing at home there is a quick caveat; the connectivity and printer support does vary widely. But, with that said, officer workers who want to increase productivity through printing necessary documents directly from a phone or tablet, actually can. Not everyone always has immediate access to a networked printer and PC, especially as workers become more and more untethered to a specific office location (and location within the office). Employees BYOD (bring your own device) into the office, that’s no secret. The majority of these devices are smartphones and as of 2013, 40% of employees were using their smartphones on the job and by the end of 2016, that number is estimated to increase to 56%. The need to print from any device at any time will become more important as mobile computing surpasses tradition PC computing. Want to know the importance of smartphones in job performance? Reports from The Economist show that employees and employers have different views when it comes to smartphones in the office – 68% of respondents believe that smartphones are important to job performance (just slightly less than the response for laptops) and only 48% of employers agreed that smartphones are important to job performance. When it comes to employees managing their printing needs, why go outside the boundaries of your technology infrastructure when they’re already using their smartphones? There’s no reason. So, why argue with your employees? What Are People Printing from Smartphones? Research from Infotrends shows that 30% of respondents only want to view information on their mobile/handheld device. Top two reasons for not printing from a mobile device? 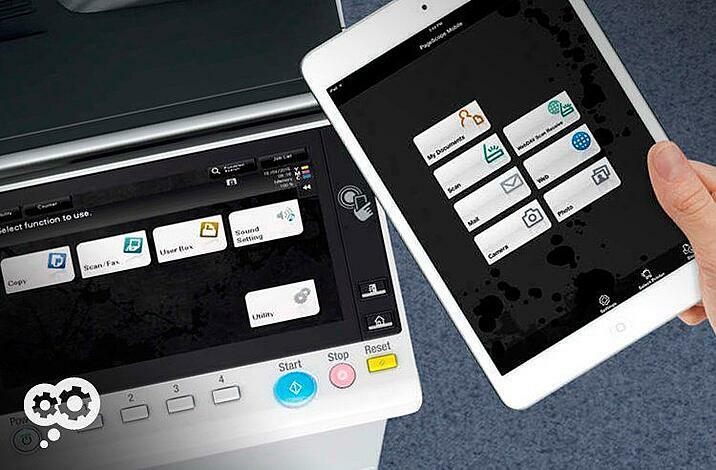 Mobile printing apps from Canon, Konica Minolta, and Kyocera can be downloaded for both iOS and Android operating systems from iTunes or GooglePlay. Almost all of the major hardware manufacturers offer apps for mobile printing that can be included as part of your IT infrastructure. There are various levels of accessibility, but all can be tied into your managed print services or other printing infrastructure so that you maintain control for security and accounting. Though enabling the functionality will differ in the behind the scenes setup, the effect is the same – securely send documents to print from enabled copiers and printers in your office all while maintaining administrative control. You can also scan documents with your mobile phones (a great way to input those business receipts or deposit checks), but we’ll save that for another post.